If you have a Sceptre Soundbar and want to control it with a Universal remote control, Cable remote, or SAT remote, we have the remote codes that will make it work. A Sceptre soundbar can be controlled with any universal remote control if you have the correct programming guide and the specific remote codes for the soundbar. If the codes below do not work with your Sceptre soundbar, please leave a comment below with the complete model number of your remote control and model number of your Sceptre soundbar and we will find you the correct remote code. 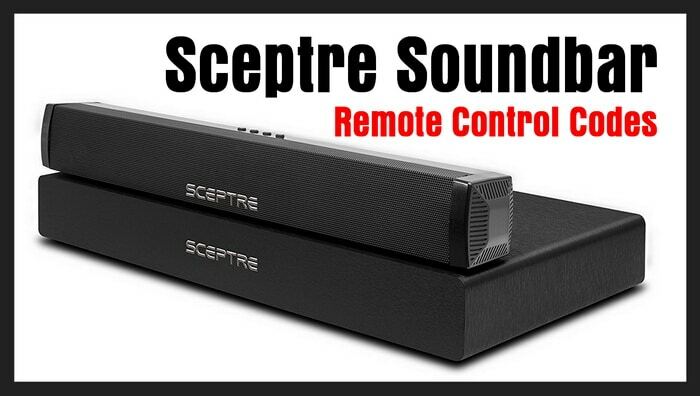 Program your universal remote control to an Sceptre Soundbar. Use the following 5 digit remote codes. – In the code search mode, the remote control will send IR codes from its library to the selected device. The above CODE SEARCH (Remote Control Programming) methods are written for Comcast and DIRECTV remotes but can be used and tried with ANY universal remote. The code search methods above are examples of how to get your current remote to control your Sceptre soundbar. Need more help programming your Universal or CAB SAT remote to your Sceptre soundbar? Please leave your questions below and we will be happy to assist. Have a Sceptre sb80-ps soundbar need dishnet hopper. Need a 4 digit remote code.